Glandwr Mill01341 281927work Guest HousePlease note that the Guest House will be closed from 02/11/18 to 03/03/19. Glandwr Mill boasts an idyllic location, nestled away in an elevated position beside the Mawddach estuary, less than two miles from Barmouth. 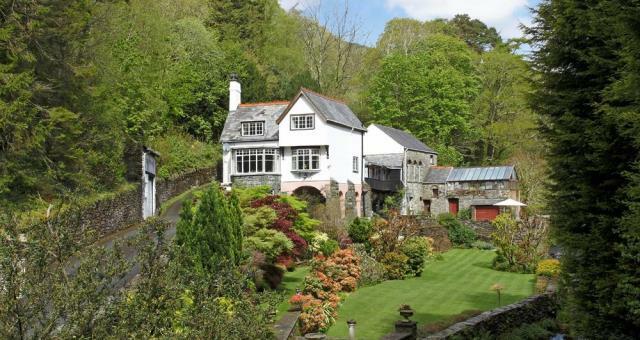 The main house built in Sir Clough Williams-Ellis style presents an elegant yet informal holiday experience. The house combined with the mill cottage and granary in part dating back to the 17th century, are set within magnificent terraced gardens and woodland totalling around 4 ½ acres. 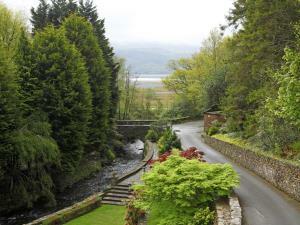 Bedrooms are south facing, offering stunning views of the Mawddach Estuary & Cader Idris range. Breakfast is served on one large table in the ground floor dining room (again with great views), or weather permitting on the terrace. Wherever possible ingredients are locally sourced and freshly prepared. Afternoon tea is served in the large south facing first floor lounge. The picture windows provide stunning views of the estuary and the Cader Idris range beyond. It’s a panorama you'll never tire of due to the ever changing light. In winter with a coal fire burning and snow on the hills it adds yet another dimension. The river Dwynant divides the gardens in two with its ever present gurgle of water. The principal garden and terraces are extensively planted with mature Camellias, Azaleas, Rhododendrons, Maples and Acers, creating truly exceptional colour in both spring and autumn. Please note that the Guest House will be closed from 02/11/18 to 03/03/19. Glandwr Mill is ideally situated for exploring this beautiful area of North Wales, well supported by both bus & rail networks. Underfloor heating in both bathrooms Children welcome from age 16. A496 from Dolgellau to Barmouth approx 7 miles from Dolgellau you come to a double bend marked with chevrons- Glandwr Mill is on the right off the double bend. By bus from Dolgellau to Barmouth (request stop) from Birmingham to Barmouth by train.